There’s no direct test for egg quality at this point in time. The only way to know if an egg is chromosomally normal is to attempt to fertilize it, and, if fertilization is successful, to perform a genetic test on the embryo. But because damage to our DNA happens naturally and inevitably over time, your age can give doctors a fairly accurate picture of what percentage of your eggs are normal. When we talk about a woman’s egg quality, we’re talking about the expected percentage of her total number of eggs that are normal. What becomes important is to minimize the damage to your eggs caused by environmental pollutants, diet and lifestyle factors, under/over nutrition, medically diagnosed health conditions and underlying genetic variations or SNPs. Science Say's You Can Develop New Eggs! Despite all of this traditional wisdom, new studies are beginning to suggest that a woman may, in fact, be able to produce new eggs in her lifetime. The theory is based on the existence of stem cells found within the ovaries. This theory stems from a finding back in 2004 when researchers encountered germ cells called oogonial stem cells in the ovaries of female mice. Then, later in 2012, a study conducted by scientists from Massachusetts General Hospital and the University of Edinburgh and published in PLoS Genetics found the same stem cells inside of a human female’s ovaries. Age remains an important factor because although your body produces new eggs even as you age, the “housing” for your eggs becomes less ideal with age. Which is why it's so important to protect this environment! If you’ve been told your odds of getting pregnant are low because your eggs are “old,” there’s still hope as long as your body is producing new eggs. It’s important to make the right diet and lifestyle changes to facilitate healthy egg development. How Long Do Eggs Take To Form? It takes 90 days for an egg to fully form, which is why you must adhere to diet and lifestyle changes for at least 3 months in order to see any benefits. 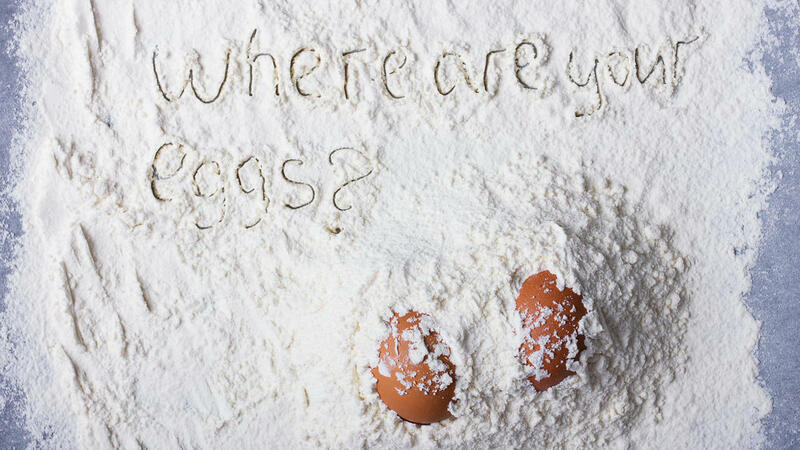 As your eggs change in preparation for ovulation they are susceptible to healthy and unhealthy influences. Here are 5 of the most important factors to consider when trying to get pregnant and improve egg quality. Hormonal imbalances are incredibly common and can be caused by any number of things including environmental factors, stress, and modern diets. Imbalanced hormones can lead to an out of synch fertility cycle, in which case ovulation may not take place. Healthy eggs require oxygen-rich blood flow. Blood flow can decrease if you do not exercise regularly, you do not drink enough water, you have thick blood due to nutritional deficiencies, environmental pollutants or underlying health conditions. Something I do regularly assess and test for problems with iron and hemoglobin. Many fertility problems are due to impaired iron conversion and this is rarely tested for and test results are often misread. It is important to address poor blood flow and oxygenation and this can be triggered by autoimmunity, post infection, nutritional excess' or deficiency (copper, magnesium or iron are good examples). What you eat directly impacts the health of your eggs. There are countless foods that help promote healthy egg development and aim to avoid foods that negatively impact egg quality. Nutritional deficiencies and excess' play a role in fertility health (copper is a good example of this) and at BUMP we offer a full range of nutritional testing. Knowing what is causing poor egg quality means you can increase your chances of restoring fertility faster. Don't let it be a game of hit and miss. A full fertility health check is a great way to improving your chances of conceiving with our without IVF. Stress impacts your body in so many ways, including egg quality. When you are regularly stressed out your body produces prolactin, cortisol and other hormones that can deter your body from regular ovulation. At BUMP we assess your stress levels and offer a full range of lab testing to test for stress hormone imbalance. One of the most reliable ways to determine whether environmental toxins may be causing your symptoms is to keep a diary of symptoms. Common symptoms of environmental toxins include irregular ovulation, Premature Ovarian Failure, failed IVF cycles, poor egg or sperm quality, recurrent miscarriage and many more. In addition, several tests are available to help confirm an environmental toxin diagnosis. BUMP offers a broad variety of environmental toxicity testing including organic acid testing. The organic acids test is a simple urine test that looks at biomarkers from various metabolic pathways. These biomarkers give an overview of several major systems in the body and an analysis of nutritional deficiencies in the body. The organic acid test is a nutritional test providing insights into the body’s cellular metabolic processes. Organic acids are metabolic intermediates that are produced in pathways of central energy production, detoxification, neurotransmitter breakdown, or intestinal microbial activity. Marked accumulation of specific organic acids detected in urine often signals a metabolic inhibition or block. The metabolic block may be due to a nutrient deficiency, an inherited enzyme deficit, toxic build-up or drug effect. The organic acid metabolic and environmental pollutant panel is the most comprehensive assessment in the essence that it covers several major systems in the body looking at all other organic acid profiles.